Georgia born Chan Gailey, has been coaching at the college or pro level now for roughly 35 years, working at a variety of levels before being hired to coach with the Denver Broncos in 1985 and is considered a member of the Dan Reeves coaching tree. 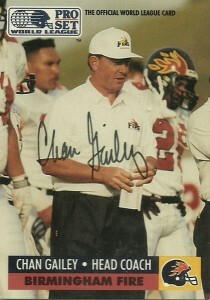 He’d spend the next 6 seasons there culminating in the offensive coordinator job, before he became the head coach of the Birmingham Fire in 1991. Making his mark with the team in nearby Alabama, Gailey’s team would make the playoffs both years of the WLAF’s existence. The teams’ were surprisingly known not for their offense, but rather a staunch defense that kept the team in most games. After the 1992 season and the WLAF folded, Chan briefly returned to the NCAA football level, but in 1994 he’d be hired by the Steelers where he’d stay through 1997. He’d serve as head coach of the Dallas Cowboys in 1998 and 1999, but could never shake the image as Jerry Jones’ puppet and that his teams were not tough enough. Even though his teams would make the playoffs both season and lose after the first round, (and Troy Aikman felt that Gailey was a prehistoric dinosaur) Chan would not be detained as the Cowboys head coach. He’d be hired almost immediately to be offensive coordinator of the Dolphins in 2000 staying there through 2001, before returning home to Georgia Tech in 2002. His name got consideration for the head coaching jobs in both Pittsburgh and Miami. Gailey would coach Tech through 2007 and then be hired by the Chiefs in 2008 as offensive coordinator, but was demoted and not retained by the team. In a surprising move by the Buffalo Bills, in 2010 the team announced Chan Gailey as the team’s 15th head coach partially on a recommendation by former head coach Bill Cowher of the Steelers. Gailey’s offensive philosophy is one that adapts itself to the players available on the team and along his stops, outside of his current one here in Buffalo, have been good at maximizing very average talent while more importantly hiding those players inefficiencies. The charge against him in response to this is that his teams’ offenses have been charged with being too conservative. 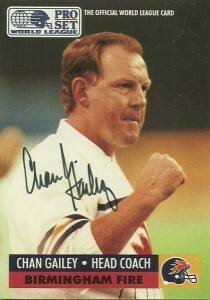 I jump at the chance to get WLAF autographs and I got his autograph in a quick 7 days from the Bills office. I wish him all the luck but I honestly sent off so quickly for him because I haven’t given him much of a chance up there. The Bills have become a graveyard for good coaches. Below are his WLAF statistics.